Living all alone in the snow under a starry sky, a little white owl imagines himself as a knight or as a rocket, blasting off to the moon. These fantasies inspire him to take off, he journeys to the tropics where he meets some very colorful owls. To the white owl, they seem just like him, but the other birds don’t feel the same, and order him to go away. After he tells the colorful birds his magical stories of castles, knights, and dragons, though, they are so stricken by his tales, that when the white owl goes back to his snowy home, the tropical crew begs to join him. 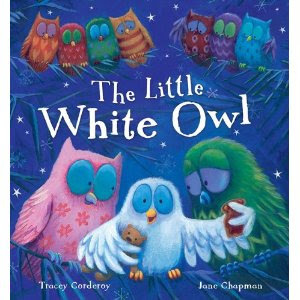 The tropically hued, textured illustrations show the huge-eyed birds’ transformation from mean bullies to friends of the little white owl. This is one of my favorite stories to read at the beginning of the school year to my students. The pictures are engaging and really capture the attention of my students, my little kids at home are no exception. They enjoyed listening to this story as well, captivated by the vivid pictures and colorful owls. This story teaches a very valuable lesson. That no matter how small, or different someone may be you can't really judge a person until you get to know them. Using the message of this story to bring together a class, a family or a group of friends helps little ones to see the importance of their actions and words towards others. As the school year gets started it's important to remind students, no matter what age they are, of the importance of being accepting and valuing each others differences. A fun little activity to remind students of this story and it's valuable message is to make little colorful owls. I did this tonight with my two little ones. Since my two little ones are too young to cut such small items I cut my pieces out ahead of time. You need to cut 2 white circles, two smaller black circles, a small triangle, and a heart from the felt. Use the scrapbook paper to cut small rounded rectangles (feathers) out (trace the tip of your pinky finger as a guide for size). Leave the favor box flat, have your little one use the glue stick to attach the feathers in a row, It is easiest to start at the bottom and work your way up. Leave about 1 1/2 inches empty at the top of the box ( for the eyes). Even my 18 month old son got in on the crafting action. He loved using the big glue stick most of all....I am pretty sure by the time he was done everything was stuck to the table. With a little direction he was able to keep up with his 4 year old sister. Attach the eyes and beak and then assemble the favor box folding the top and bottom, then place the heart shaped (claws) at the bottom for the little owl to stand on. If you love owls as much as we do, be sure to check out our Back to School is a Hoot Kit!